As the AP-A4H is the smallest A4 flatbed printer. 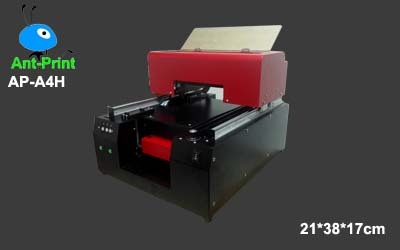 Different from other flatbed printer, it is the heading moving while printing. You can print different materials based on different ink, specially for printing on food, such as coffee, chocolate, macaron, cake, candy and so on. — All kinds of pictures will be printed with high resolution. — The printer with high quality infrared sensor can be operated easily. — As this model is head moving, so people can use it to print on coffee. — Max height is 17cm, so you can print on cake as well. Printing Technology Advanced Micro Piezo 6 color pigment inkjet technology, two-way printing.